Welcome to Scoreboard Pressure‘s second annual series of Grand Final scoreboards, where we bring you season finales from across the country and across the decades. Last year’s Grand Final series was a four-part series, so we’re kicking off this year’s series with part five. 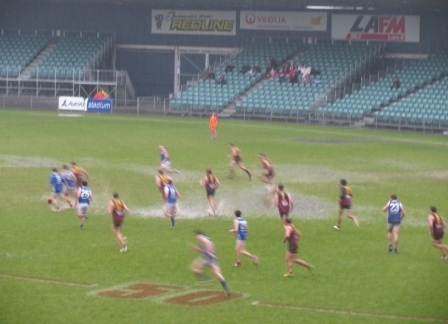 This week: a soggy NTFA Grand Final two years ago, and the one-off Waverley Park Grand Final from 1991. Yes, these scores are correct. 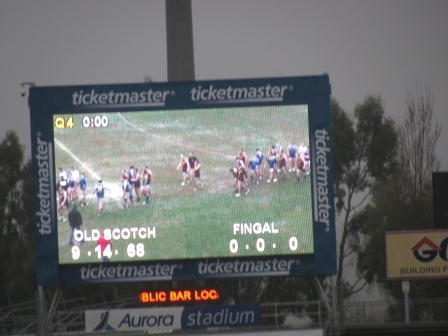 In the 2010 NTFL second division Grand Final at Aurora Stadium in Launceston Old Scotch won by 68 points, keeping Fingal absolutely, totally, humiliatingly scoreless. Former Old Scotch premiership player Bill Walker recalls: “Old Scotch went through the season undefeated and won their second flag in a row after a 20 year hiatus. In the last quarter a Fingal player got a very dodgy free kick from about 20 metres out and hit the point post on the full. Even though the game was well and truly over the atmosphere was electric as it became apparent that Fingal may not score – there was some pretty desperate wet weather stuff going on from both teams. 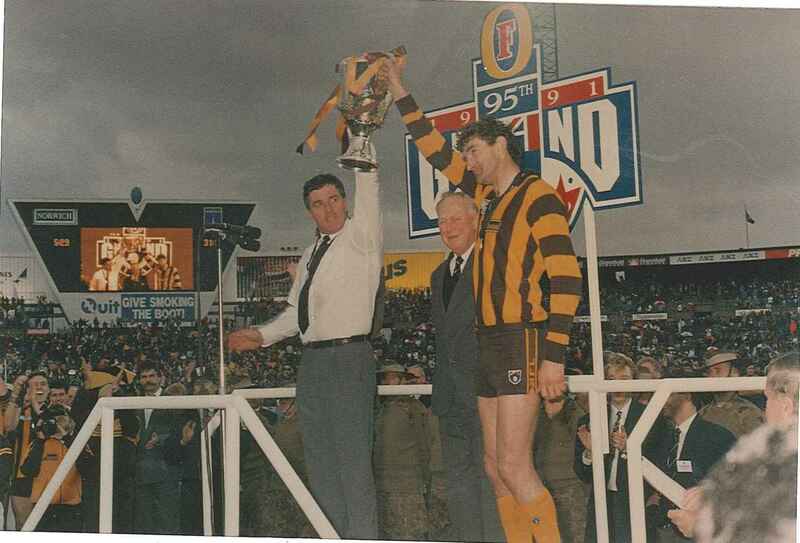 Coach Alan Joyce considers rejoicing and captain Michael Tuck almost smiles as they hold aloft the 1991 premiership cup. Waverley Park, or VFL Park, hosted just the one AFL Grand Final, when Hawthorn beat West Coast by 53 points: 20.19 (139) to 13.8 (86). Hawthorn ruckman Paul Dear won the Norm Smith Medal. The MCG was unavailable due to rather major works on the Southern, now Great Southern Stand. The Grand Final gained notoriety also for the so-called entertainment, which included Angry Anderson singing Bound for Glory from, or beside, a Batmobile. Where is the Batmobile these days? And, more importantly, whatever happened to the scoreboards at Waverley Park? There were at least two generations of them, neither of them popular. But if you know the fate of the old Waverley Park scoreboards, contact us here at Scoreboard Pressure. 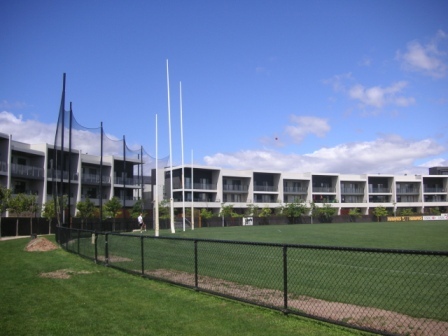 As for Waverley Park these days, it’s the home of Hawthorn’s museum, offices and training facilities. It’s also a housing estate. Do these homes house the ghosts of scoreboards past?